A couple weeks ago, right as I was setting up for one of my classes, “A Culinary Compass of Mexico,” at the Mexican Cultural Institute, Alberto Roblest came over and asked me a great question. Alberto is doing a project with the support of The Office on Latino Affairs. It is called Hola Cultura and explores the contributions of Latinos to DC life and culture, from art to language to sports to cooking. I think he meant for me to respond with an either or. He really did. Come on Pati, “traditional” OR “new,” he insisted. But I kept answering “BOTH!” As I kept trying to explain why, I realized so wholeheartedly that both traditional and new not only describe my cooking style but also one of the many wonders of Mexican cuisine. See… I thrive on exploring, traveling, tasting, testing, recreating and passing on traditional Mexican cuisine and recipes. If I get to live to be 120 years old, I won’t have enough time to taste and share all the rich and vibrant regional cuisines and dishes that exist across Mexico. Mexican cooking has such sturdy pillars and is so strong, partly because generation after generation, tried and true recipes are passed on, sometimes written and sometimes not. When a dish and its traditions somehow get lost in a family, neighborhood, or community… once it is found and recreated again, a lifeline that holds us together suddenly appears! Even if its on the other side of the globe. When I receive a request for that “much needed but can’t be found” recipe, I jump for joy! I am sent on a serious mission, and I don’t stop until it is completed. At the same time, Mexican cuisine is so strong because it has a treasure trove of fabulous ingredients that are so accommodating in their use. As long as one understands the ingredient and its genuine nature, there are so many ways to experiment with it. That is also how a cuisine expands, by creating new combinations and testing the limits, sometimes failing and sometimes succeeding. Surely, many of the traditional takes were once new too. While I dedicate so much of my time researching and passing on what has existed for generations and centuries, I can’t resist creating new dishes. Funny, that it happens many times with salads, like the Watermelon and Tomatillo Salad. For the one on this post, which I have been obsessively repeating, I use watercress, called “berros” in Mexico (I happen to love that word). They are used tremendously in Mexican kitchens for salads. They are delightful: a bit bitter, made up on thin leaves but packed with flavor and such a nice delicate bite. 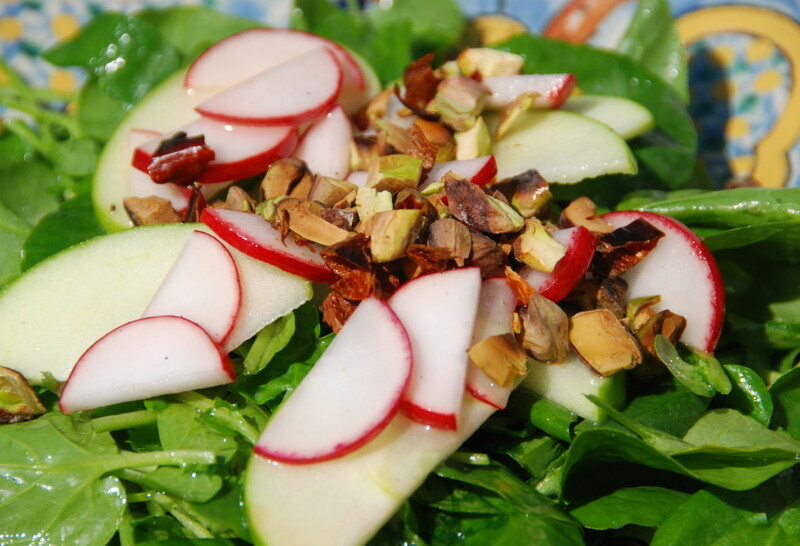 On top goes a combination of thinly sliced tart green apples and pungent radishes. One ingredient snapped from a tree and another pulled from the ground! Both ingredients have a bright colorful outer skin, yet, inside are crisp white. I use them both raw, and get the most of their watery crunch and contrasting taste. Then it is all covered in a light vinaigrette with a bit of mustard and a bit of honey. Then a stellar topping tries to steal away the show. 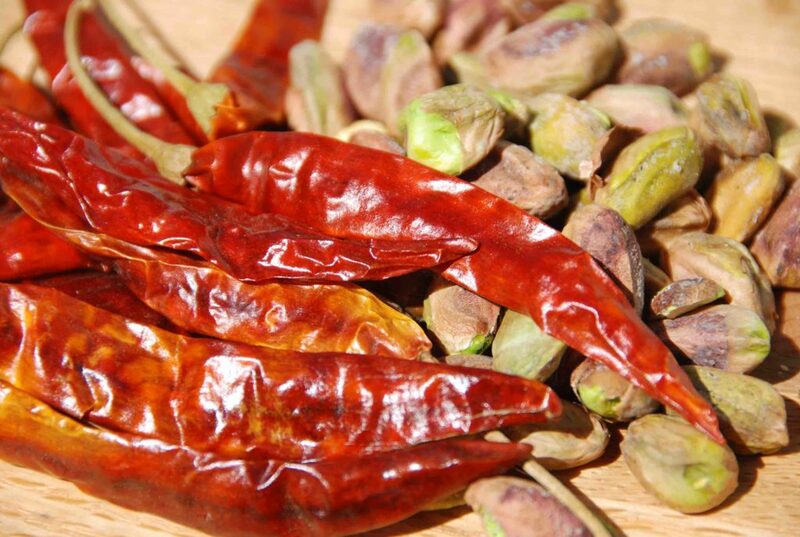 Toasted chile de árbol and pistachios, chopped together. A smoky, lightly spicy, crunchy, nutty and ironically sweet combination. You won’t believe how sweet the pistachios taste on each bite. p.s. All that said: send along more requests for any more Mexican recipes you are craving at any time. 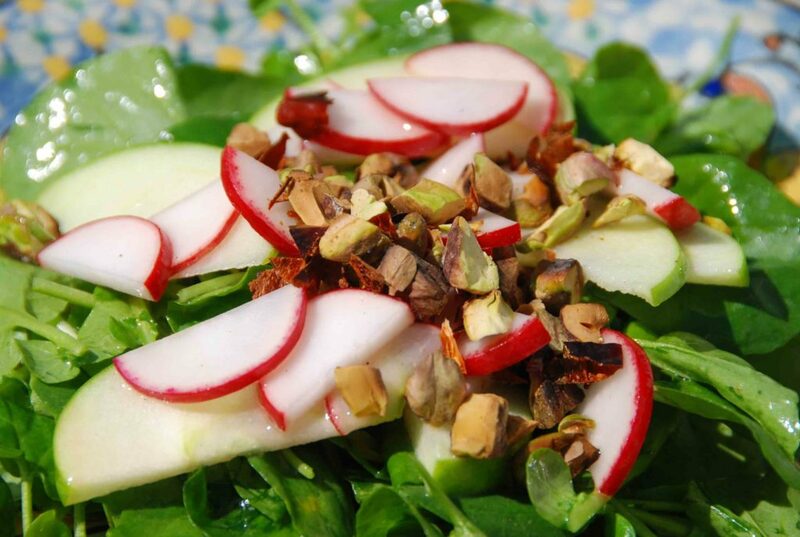 Place the apple and the radishes in a bowl. Place the watercress in another bowl. Heat a a small 6 inch skillet set over medium low heat, add the pistachios and toast anywhere form 3 to 5 minutes, stirring often, until they are nicely toasted, but don't let them burn. Remove form heat. In the same skillet, toast the chiles de arbol anywhere from 3 to 5 minutes, flipping sides, 1 or 2 times along the way, remove from the heat. Remove the stems from the chiles de arbol. In a chopping board, chop the chiles de arbol. You may remove the seeds once they are chopped or keep them. Add the pistachios and chop them along with the chile de arbol creating a pistachio chile de arbol mixture. In a small bowl, combine the mustard, honey, salt, pepper, rice vinegar and lime juice with a whisk or fork. Slowly, pour in the oils and whisk or mix very well until thoroughly combined. 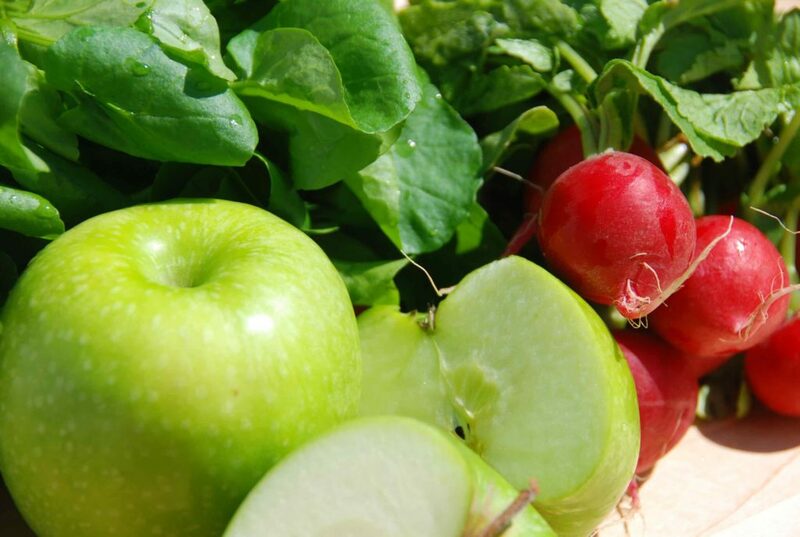 Pour half onto the apple-radish mix and half onto the watercress. To serve, on small appetizer plates, add watercress, top with the apple-radish mixture and sprinkle some of the pistachio-chile de arbol mix on top. Just made this and I thought it was one of the best salads! I didn’t have watercress so I used baby spinach and arugula and added a few golden raisins. LOVED it, and the nuts with the Chiles smelled amazing when being toasted. Awesome! I’m glad you enjoyed it and made it your own, Heather. Just do a search for “avocado” on the search box of my website and you will find all the information you need! I hope to see more of your TV programs, in the meantime, I am collecting a few of your recipies. Is a DVD of your cooking available? is a cooking book with your various recipies available? Thank you so much for your lovely comment Bernardo! I do not have a DVD out yet, but may come out with one after the second season airs in the fall. About the cookbook, I have one coming out early 2013 and will be sure to keep you updated!